The term “traffic calming” describes a range of improvements that reduce traffic speeds or traffic volumes intended to improve safety for all road users. Treatments are mostly appropriate for local streets not meant for through traffic. Some traffic calming seeks to slow down through traffic, while other traffic calming seeks to divert through traffic and reduce traffic volumes. A combination of traffic calming measures often provides the best results. One technique should not be used multiple times along a roadway or within a community. It increases driver familiarity and reduces the impact of the traffic calming device. Securing community support before proceeding with a traffic calming project can help to make it more successful. Benefits to local residents may include a safer neighborhood to walk and bicycle in, though sometimes at the cost of driving convenience. Instituting traffic calming measures also requires close coordination with the municipality or owner of the proposed roadway. They should be combined thoughtfully with the other improvements described in this toolkit. Traffic calming measures in the context of a Safe Routes to School program can help reduce driving speeds near schools, discourage dangerous or illegal driving maneuvers, and encourage the use of appropriate routes when driving to or from school. 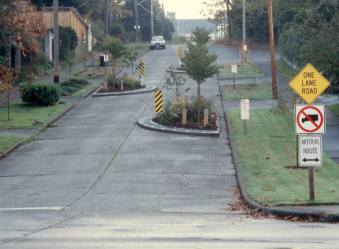 Speed humps are rounded vertical traffic calming features common on residential streets, and may be used to control speed along a corridor. Speed tables are similar mesa-shaped features that may be configured as raised crossings, as shown above. 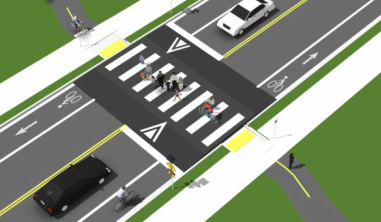 If configured as a raised crossing, the speed table should be elevated so that it is flush with the sidewalk and/or multi-use trail. Traffic circles are generally used to replace a 4-way-stop intersection. 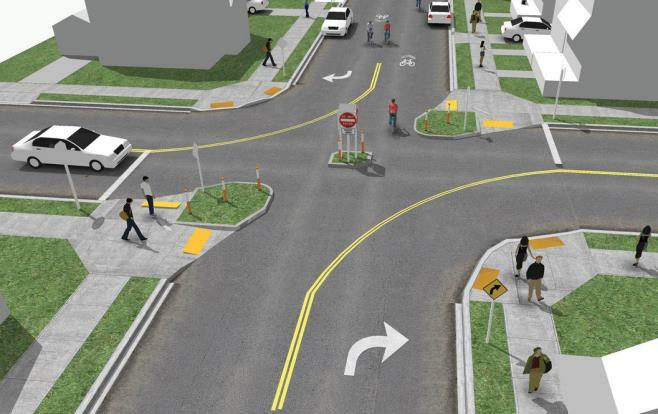 Traffic circles can improve safety as well as travel times and intersection efficiency. Many drivers are not familiar with traffic circles so signage can help them to navigate the intersection. Many traffic circles are built with mountable curbs so that emergency vehicles may quickly and easily proceed through the intersection. A chicane is a curb extension, usually built in alternating patterns or with intermittent median strips, that creates an S-shaped curve on a street. These minor curves require motorists to proc﻿eed with greater caution and slower speeds. They may also provide additional space for landscaping or pedestrians. Some chicanes are concrete curbs, while others are painted on the roadway. 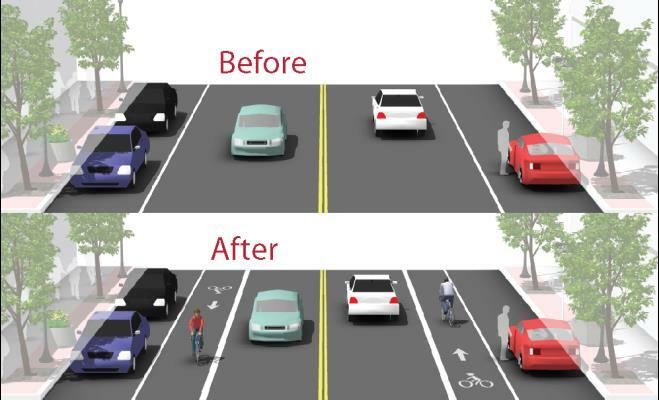 Lane narrowing utilizes roadway space that exceeds minimum standards to provide the needed space for bike lanes. Many roadways have existing travel lanes that are wider than those prescribed in local and national roadway design standards, or which are not marked. 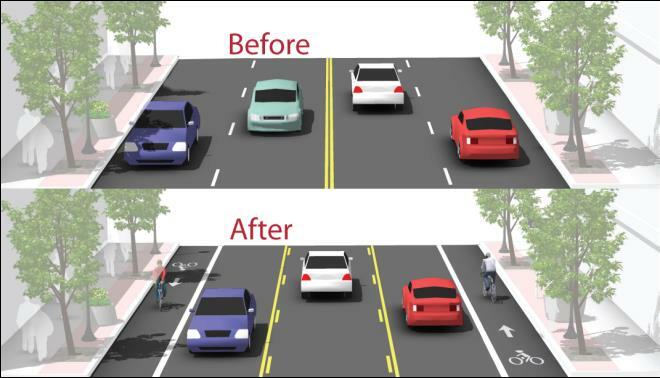 The removal of a single travel lane will generally provide sufficient space for bike lanes on both sides of a street. Streets with excess vehicle capacity provide opportunities for bike lane retrofit projects. A diverter diverts motor vehicle traffic from one street to another while allowing pedestrian and bicycle traffic to proceed normally. They are most common parallel to arterial streets where congestion may lead motorists to seek alternative routes on local streets through a neighborhood. Common on bike routes, diverters are the most intense traffic calming treatment applied and should be implemented only after study and community outreach. 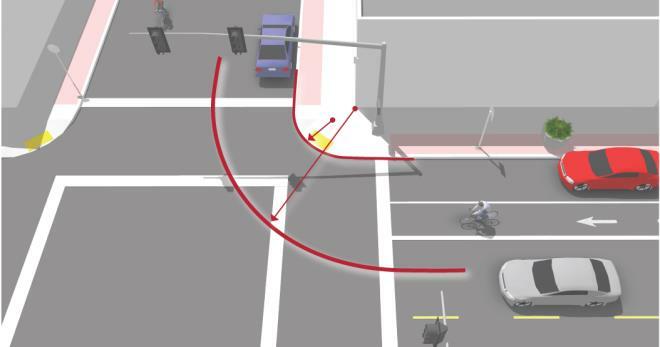 The size of a curb’s radius can have a significant impact on pedestrian comfort and safety. 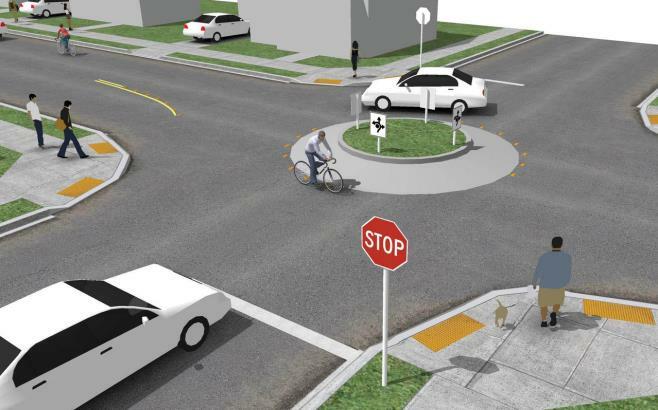 A smaller curb radius provides more pedestrian area at the corner, allows more flexibility in the placement of curb ramps, results in a shorter crossing distance and requires vehicles to slow more on the intersection approach. During the design phase, the chosen radius should be the smallest possible for the circumstances.